The installation of Microsoft SQL server parts during eWay-CRM installation can show the window with this text: "An installation package for the product Microsoft SQL Server Native Client cannot be found. Try the installation again using a valid copy of the installation package 'sqlncli.msi'". The SQL Native Client component cannot be installed during SQL server installation. Any instance of the SQL server is installed (if you choose expert installation, there will be no selection of existing SQL server instances). You have to install application called Windows Installer Clean Up. 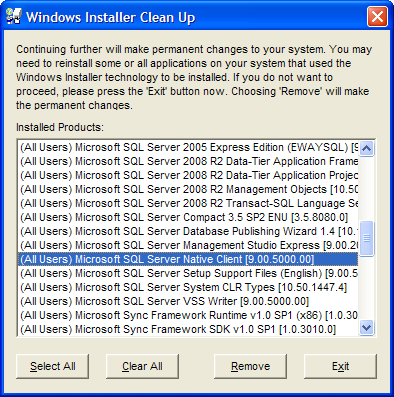 In the Windows Installer Clean Up, select the Microsoft SQL Native Client component and click the Remove button. The repeated installation of eWay-CRM should proceed correctly. Note: If the removal of the Microsoft SQL Native Client component won't help, try to remove all components their name starts with "Microsoft SQL Server".